Among Asus's considerable offerings at this year's CES convention in Vegas was a minor but well-made dock for Google's Nexus 7 Android tablet. 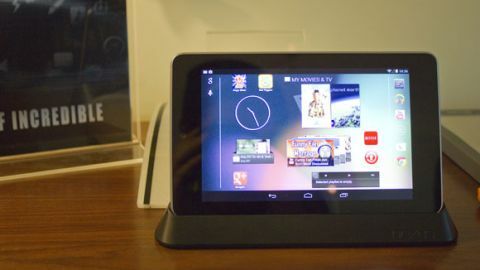 The Nexus 7 carries Google's branding but is made by Asus, and the Taiwanese company took special care to design an unobtrusive and sturdy dock for the 7-inch tablet. The Asus Nexus 7 dock isn't going to win any beauty contests - it's got no bells and whistles, aesthetically or otherwise - but its design is simple and effective. TechRadar stopped by Asus's suite at CES to check out the dock in person and weigh in with our thoughts. Asus's Nexus 7 dock is made of sturdy plastic with a rounded design and the word "nexus" emblazoned across the front in Google's familiar but attractive font. Around the back you'll find a microUSB port for charging and an audio out for headphones or speakers, though the lack of an HDMI port will limit the dock's media-output capabilities. It's definitely not meant to help you integrate the Nexus 7 into your home theatre system; rather, it's essentially a charging station where you can leave the tablet when it's not in use, propping it up in landscape orientation. And at that it excels; despite its plastic material, the Nexus 7 dock is sturdy and heavy enough that the tablet is unlikely to tip over. A rubbery foot will help it stay in place as well. Asus did not have pricing or availability details to share with TechRadar, though several other sites have reported a U.S. launch at $40 and a £24.99 release in the U.K., possibly as soon as the end of the week. Nexus 7 users hoping for more features in a dock could wait for a more versatile version to come out, but for those who simply need a place to prop up their tablets, this will likely do fine.